Digital transformation is in the air. Customer expectations are growing for want of better digital experiences. However, even the slightest code change could take around four to six weeks and that inevitably delays the overall production. How does one tackle the situation at a time when the software driven world demands quality without compromising the speed of delivery, fundamentally because of business agility and velocity and to remain ahead of the competition? Considering the fact that both speed and quality are equally important, In software development, Continuous Testing is getting popular day by day. Hence automation in testing is no longer an option but a necessity. However, the Thin Red Line between Automated Testing and Continuous Testing Remains. — Jeff Scheaffer, General Manager, Continuous Delivery, CA Technologies. The objective of Continuous Testing is not only to meet the requirements but to ensure quality delivery such as Performance, load and security. Understanding Business Risks is the primary goal of Continuous Testing. Rather than focusing on the use cases or test scenarios like automation test suites, Continuous Testing addresses the usage of the application and the interaction of the components with other applications. Going beyond UI level testing, it focuses on the UX part as well as validates the changes and their impacts on the user experience. Moreover, Continuous Testing is all about implementing Automation Testing at the very beginning of the stage so that the testing could be initiated in parallel with development activities. DevOps helps businesses to deliver value by encouraging close communication and collaboration between Development, Testing, and IT Operations teams with a focus on Process Automation all along the way to increase the speed of delivery. 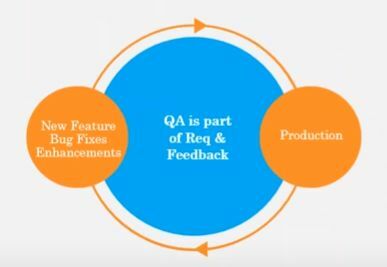 It helps QA teams to see the big picture so that they can get involved in planning, designing, and automating the changes through Continuous Testing. While large Automation Test Suites are comparatively slower for Continuous Integration and there remains a risk of missing Defects, Continuous Testing targets the code changes after the last test execution, which helps to identify more Defects in a shorter execution cycle. The main reason behind the change in mindset for Continuous Testing begins with the concern of quality. Organizations that are struggling to shorten the delivery cycle from months to weeks or days need to incorporate the practices of Continuous Testing into their CI/CD pipelines. Shifting to the left requires the need of breaking the barriers between centralized teams, Developers, Testers, and IT personnel to ensure that quality and stability are delivered along with the end product. With the first code check-in, the changes in the code need to be tested through automated tests. The concept here is strongly opposed to traditional SDLC processes such as the Waterfall. Incorporating Security and Performance Testing at the very beginning gives an added advantage of getting customers’ feedback at an early stage. Enterprises deal with several applications. Some of these are built over the years using the Waterfall methodology and some new applications are built using Micro services. Both these old and new applications have completely different architecture. 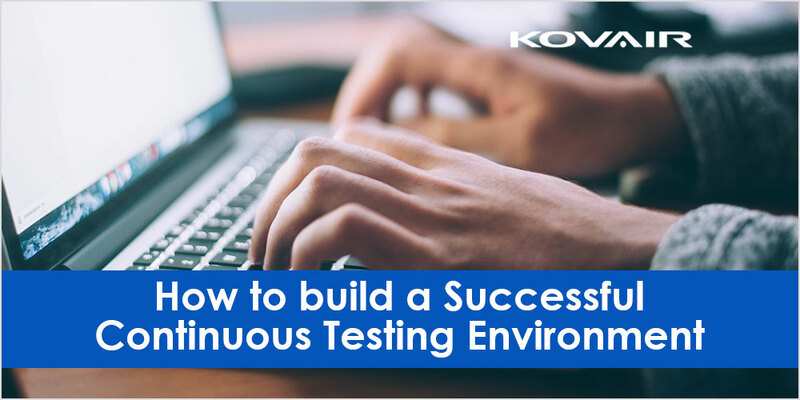 Localization of Test environment therefore becomes very crucial to enable teams to initiate the Continuous Testing job of CI/CD pipeline during code commit. Preparation of test data is a difficult task. But what’s more difficult is keeping both development and testing activities parallel to each other. And then there is also the IT Operations team that will always remain skeptical about new deployments and fear losing the stability in a Production environment. Continuous Integration helps to break these silos and involve everyone in a team to ensure both quality and stability of the product are taken care of when working towards a Release or Delivery date. Moreover, it is not only about shifting left but also about shifting right. A successful CI/CD implementation requires proper selection of tools that would help to serve the purpose. From the source control management for code commit to reporting the Test results in dashboards – several tools are available for different domains. However, it is really difficult to specify a set of tools that will fit the work culture of all the organizations. Automation is a basic need for Continuous Testing. So learning about how to automate testing in a continuous test environment setup is the first thing that you need to focus on. In Continuous Testing, you will have to remember that generic automated testing does not focus on the User experience aspects. However, such subjective evaluations could be derived from collaboration of feedbacks received from users. You have to choose your tools smartly in order to find success. The objective is to seamlessly integrate these tools with your IDE for tracking the defects and finally sharing real-time metrics with your team members and other stakeholders. You will also need to consider the tool set for supporting everything from initiation to closure of your project. You may not need too many Test Cases but a limited number of smart test cases that can help you to identify the defects in you code changes. Then there is the effort needed for maintaining the Test bank as well. A test-driven development is a good approach where the Development codes are built based on the Test Cases. In this Cloud era, you cannot overlook performance and security issues. In your Continuous Integration pipeline, include performance and security checks along with functional testing, evaluate the severity of the defects, and set a benchmark on the risk level that will not affect your business. Agility practices have made the teams come closer to each other and work together on a particular Release or delivery. Developers should be able to write scripts for their own codes, Testers will need to focus on integration testing, maintaining the testing framework and refactoring test suites, and Operations team will be providing Production like environments. Based on the above diagram, there is more than one way that Kovair Intelligent DevOps can help achieve Continuous Testing with multiple tool choices and their integrations. Shubhrojit Sarkar is the Manager - Testing and QA at Kovair Software. He has overall 8+ years of experience in Software industry, predominantly in Testing, and QA. Shubhrojit heads the Testing division at Kovair and his key responsible areas include guiding testing teams for both manual and automated tests, managing integrated testing framework for clients, and many more. He loves trekking and photography at his leisure time. Previous Post:How to Create Top Quality REST API? You are absolutely right, ‘Considering the fact that both speed and quality are equally important, In software development, Continuous Testing is getting popular day by day. Hence automation in testing is no longer an option but a necessity. However, the Thin Red Line between Automated Testing and Continuous Testing Remains.’ Updating applications in real time, delivering value for the customers and ensuring constant innovation is impossible without nurturing the practice of Continuous Testing. Enterprises are able to deliver key projects under their Digital Transformation objectives to deliver value and enhanced experience for their customers. This makes it business critical.